Download from the patch download page. For more information, see the NeoOffice 2.2.3 release notes. NeoOffice is an OpenOffice.org-cousin that nicely integrates with Mac OS X, unlike the regular OpenOffice.org 2 for Mac OS X, which requires X11 to function. Even though a beta of OpenOffice.org 3, with a native Aqua version, has been made available, NeoOffice is still standing strong as a stable OpenOffice.org cousin that provides slick Mac OS X integration. Standing isn’t the right word, though, because it’s constantly improving. magnify and swipe trackpad gestures: or at least on hardware that supports it (MacBook Air and recent MacBook Pro models). Previously, NeoOffice 2.2.3 Patch 2 added horizontal scrollwheel support. The OpenOffice.org 3.0 beta is now available from download.openoffice.org. One of the most compelling changes is Mac OS X support. Localized builds are also available, but not directly linked from that page. Instead, check out one of the mirrors. Currently, most Mac users prefer NeoOffice over OpenOffice 3. OpenOffice 2 does not work under Aqua (only under X11) and NeoOffice has a history of stable OpenOffice-functionality for the Aqua/Mac OS X platform. This may change once OpenOffice 3 becomes (more) stable. One of the limitations in NeoOffice 2.0 and 2.1 is that the maximum resolution when printing 300dpi. This is especially an issue when printing images with tiny details, such as screenshots. Photos are normally just fine at 300dpi. open in Adobe Reader and print from there. That’s it, now you can have higher quality output. >I’ve covered NeoOffice 2.0 before. Recently I switched to 2.1 on one of my machines. Due to some issues with 2.1, I decided to stick with 2.0 for a while. Overall, NeoOffice 2.1 looks and feels more professional than 2.0. However, the integration with the Mac OS X operating system still leaves a lot of room for improvement, IMHO. sometimes pressing Shift-Enter inserts 2 newline-characters instead of one, this seems new since NeoOffice 2.1. >NeoOffice is a free port of OpenOffice.org for the Mac. I’ve now been working with it for a few months. The program automatically checks for updates, which most programs seem to do by now. My current version is 2.0 Aqua Beta 3 Patch 15. Don’t ask me what that means, exactly. But it’s fairly stable. 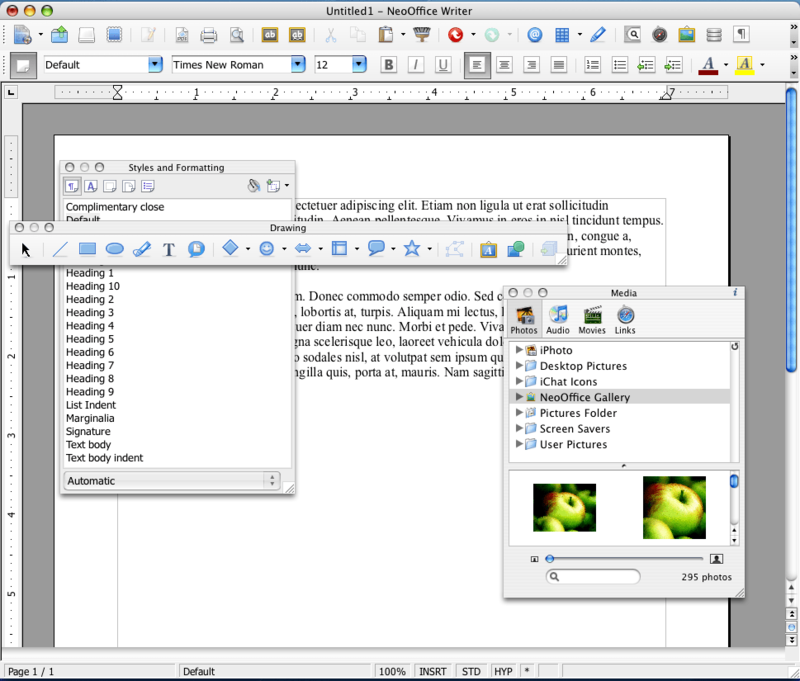 An alternative to using NeoOffice is using OpenOffice.org directly on the Mac. This works fairly well, but requires X11 and does not provide an integrated solution. See the OpenOffice.org for Mac porting project. So although the product works quite well, it’s far from being a well-integrated Mac OS X application like any of the OmniGroup apps. Perhaps they should consider creating such a beast, although the business model for it may be hard to produce. At openoffice.org they themselves are also working on an Aqua-port of their product. There was an announcement early February 2007 labeled OpenOffice.org Mac Porting team announces the top ten items to be fixed before alpha Aqua release. Interesting to know there are apparently some people working on it, but there’s not much information available on planning.